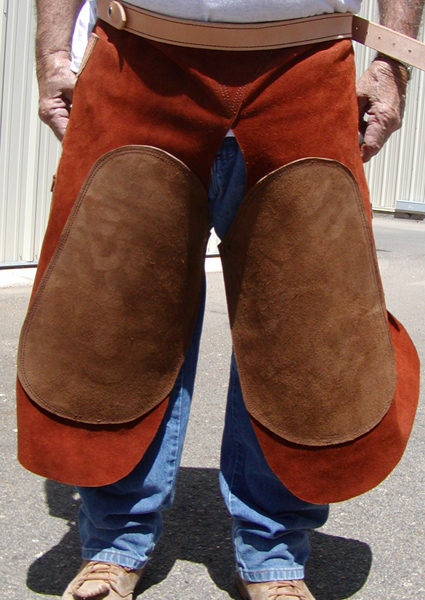 Designed for the Pieh Legacy Collection with the input of many farriers. Our apron is made locally, in Camp Verde, Arizona. The apron features double stitching throughout. The groin area is left open for more comfort and mobility. The handsome rust color of the suede leather may vary. 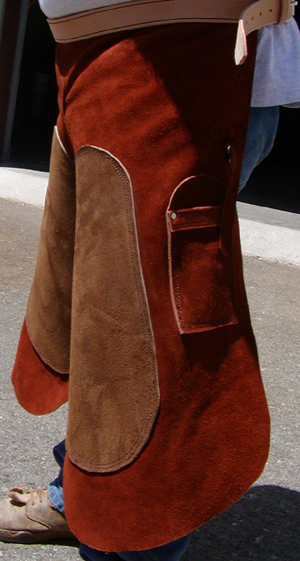 Made from top quality split cowhide. The body of the apron gives extra cover on the outside, while not bulking up the outside with stiff kneepads, keeping the kneepads where you need them-between your legs and on your front thighs. The 2 generous knife pockets are set at an angle so that the knife is easier to grab and are deep enough to protect your knife. The Knife pockets are reinforced along the top edge and are both sewn and riveted on. The leather belt attaches with an adjustable metal Roller Buckle on one end and 2 snaps on the other end. The leg straps are secured with a snap style fastener so you can get out of your apron quick. Length: 27 inches, tapering to 25 inches at outer leg. You can also order the apron with straight pockets if you do not want the angled knife pocket style. We can sew a 3" Magnet below the knife pocket on either side or both sides. Magnet is enclosed in leather on back side.